This is why I despise government. Every decision made in DC adds thousands of new government placemen at a cost of millions in salary and an ever expanding government. That is what happened when John Boehner did not immediately put a stop to Obama’s amnesty plans in that recently concluded budget negotiations. One of the things that Barack Obama kicked into high gear with his illicit amnesty announcement was a government employee hiring frenzy. As The New York Times reports, as soon as GOP House Speaker John Boehner allowed Obama’s amnesty plan to keep its funding, 1,000 new federal jobs were opened up at a cost to the taxpayer of $40 million annually in salaries and benefits. These new employees will be housed in a building in the DC environs (Crystal City, just across the river in Arlington, Virginia) that will cost taxpayers an additional $8 million in rent each year. The fact is, with every such decision to create this new agency or enlarge the duties of that agency, or to initiate some new program or another, it always means the growth of government and more government jobs–all of which cost us all millions more a year in useless salaries and overly generous benefits. Already this nation has gone topsy-turvy in that the most lucrative jobs from an individual’s perspective are government jobs. Government workers make better pay, have more time off, can retire earlier, and have better benefits than anyone in the private sector. And government jobs offer little of value to the economy or the nation. Government doesn’t create jobs. It merely costs those of us working in productive jobs more in wasted tax dollars. 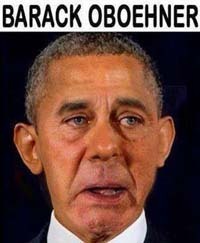 Sadly, by only mouthing the anti-amnesty line, House Speaker John Boehner and the Republican Party worked hand-in-hand with Barack Obama to cost the citizens billions in wasted tax dollars, helped Obama inflate an already glutted government, and did nothing to stop the destruction of our immigration laws.